In my family, food is the language of love. All of my best memories from my childhood are linked to taste. My mom making special meals for birthdays. The taste of seven fishy dishes on Christmas Eve. A glass of Ovaltine my parents stirred up to ease my nerves the night before I started middle school. Homemade chicken noodle soup when we were sick. My dad’s first attempts at making dinners as a single dad. A big, creamy bowl of ice cream and homemade toppings for dinner on Valentine’s day. All of these have very specific memories of love and adoration linked to them. When it became time to introduce Ryan to his first foods, I knew that I wanted his relationship with food to reflect our family values in addition to our values on healthy, whole foods. I wanted our son to grow up strong as well as making him feel loved, and I kept this in mind as I started researching how one introduces solids to a breastfed baby. 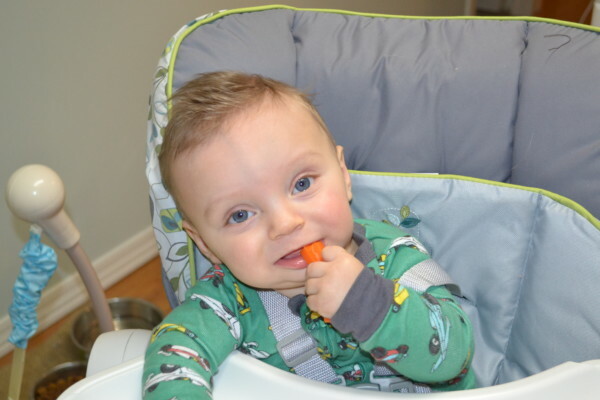 Ryan’s first solids – steamed carrots! As I’ve mentioned here before, I’ve had no experience with babies, so I’ve been starting from scratch with Ryan. I read a few different things that intrigued me – namely, making my own purees and baby led weaning. With Ryan’s allergy I knew that anything processed would be difficult and/or very expensive. 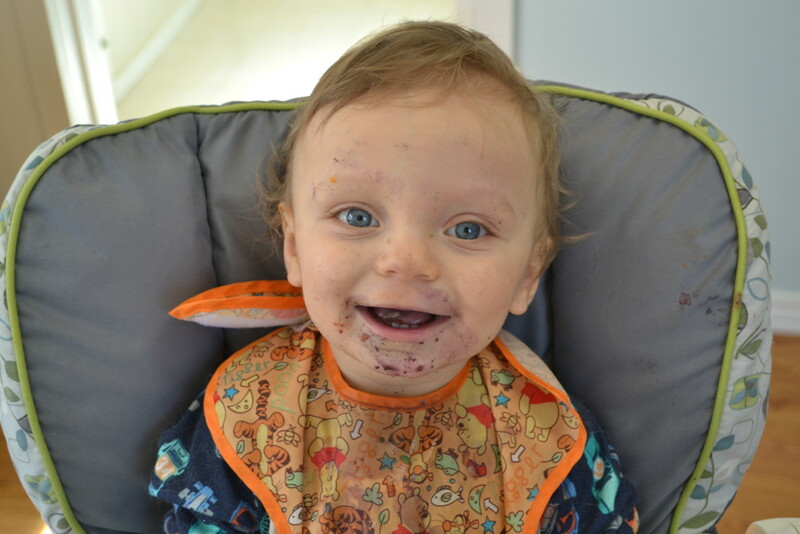 After much research, we chose to introduce solids to our son using the Baby Led Weaning method. There is a lot of information on the interwebs regarding this method that you can use to make your own decisions about BLW. I’ll put some of the links I found useful below, and I’m going to be posting more about our journey, but we couldn’t be more happy with how this has worked for our family. 1. The ease of it. The number one reason that we chose BLW is that it seemed SO much easier. Weighing the time and energy required for spoon feeding entire meals worth of purees versus chopping up some food and throwing it on a tray seemed like a no brainer for our family. We really enjoy being able to eat as a family, all at the same time, without having to spend the entire dinner fussing over Ryan. I usually prep a bunch of different things and then pick and choose what to give him for each meal. (My fridge is a battlefield of tupperware containers.) Sometimes we chop things up and put them aside from our dinner prep, which makes it even easier. 2. Some studies show a link to reduced overeating later in life. I was a chubby kid. I was overweight my whole life until I lost 40+ pounds my junior year of college. I still have a tendency to over eat and to eat when I’m not hungry. It’s something I will probably battle my whole life, and I want to do everything in my power to prevent Ryan from having to deal with this. In my research, I found that many children who are introduced to solids using the BLW method are more likely to stop eating when full. This is because they themselves are in control of what they eat. When you feel a baby purees, you can’t be sure if your baby is full or not. When a child is feeding himself, he is able to stop eating when he is full, a trait that will hopefully follow him through his life. 3 It’s so much fun! There are fewer things in this world I find cuter than a 7 month old nomming on a banana. It’s so much fun watching Ryan learn different textures and tastes when he’s eating. He quickly developed favorites and things he wasn’t too fond of, but as with everything else with a baby, those are constantly changing. It’s so fun watching him pick up a piece of sweet potato, inspect it, and happily start chomping on it. Also, he picked up and honed his pincer grip very quickly, and BLW is often credited for enhancing hand-eye coordination and grip. 4. Emphasis on whole foods. In our family, we put a big emphasis on whole foods and clean eating. Yes, Alex and I don’t live by this exclusively and eat outside these guidelines on occasion, but we both agreed we want to keep Ryan on this diet as much as we can. With his diet restrictions being in place until he is 12 months, BLW and being able to chose whole foods and clean eat for our little boy is a necessity. 5. He is in control! With BLW, there is no guessing whether or not Ryan likes something. There is no forcing him to eat something he doesn’t like. Ryan is completely in control of what he eats. Yes, sometimes I have to space things out (like giving him his fruit last – if I give it to him with his whole meal, he will eat nothing but apples!) and sometimes I worry that he won’t be eating enough vegetables/protein/healthy fats etc. but usually at the next meal he’ll even it out. His body craves what it needs and he has the ability to listen to it. So this is why my family chose Baby Led Weaning. If this seems like something that fits your values or that your family would benefit from, do some more of your own research! Our family loves it and Ryan is thriving on it. Here are some links and blog posts that I found most helpful when first deciding and starting out! Hope this helps, and feel free to reach out to me to ask questions and find out more information! babyledweaning.com – the original source of BLW and where you should start! babycenter.com – I found the comments section of this page VERY helpful! ahealthysliceoflife.com – Brittany at A Healthy Slice of Life is a BLW advocate and documents her experience with implementing BLW with her two daughters and she even wrote a book about it!